Our magnificent body is a self-healing, self-renewing, self-cleansing organism. When the right conditions are created, vibrant well-being is its natural state. We are designed to be healthy and vibrant! Unfortunately we have departed from the ways of nature and live under less than natural conditions. Have you experienced any of these yet? Even if you take the best natural care of yourself, the toxicity of our planet is undeniable. The air we breathe, the water we drink and shower with, the foods we eat, the cosmetics we use and the building we live and work in, are loaded with toxic chemicals that alone or in combination cause disease. When we take the time to remove these obstacles, add what is lacking, our bodies bounce back into health as if magic. I am a great advocate of internal cleansing program once or twice a year. In the past 25 years, I have seen amazing results with my patients going through these programs. The goal of a cleansing program is to flush our impurities and optimize function. It gives the over-burdened internal organs time for physiological rest and rehabilitation. This allows the body to free up energy to enhance healing processes. Spring and fall are the best time of the year for detoxification. It is often quite a challenge to start a cleansing program at home, working, surrounded by temptations and stress of our daily requirement. 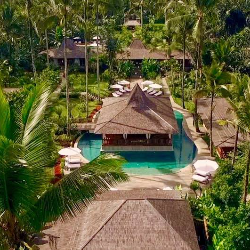 Join me for a unique cleansing program in Bali in a divine luxury 5 star resort surrounded by stunning jungle! Give your body 7 days of love, self-care and relaxation. When you have nothing to do but “being pampered”, it is so much easier to “cleanse”. Health classes and support group class. If you prefer to stay in the quiet on the amazing property by the pools, you are welcome to follow your own internal rhythm. Before Bali, I will be coaching you on how to best prepare yourself for this experience, recommending a mild detox program. 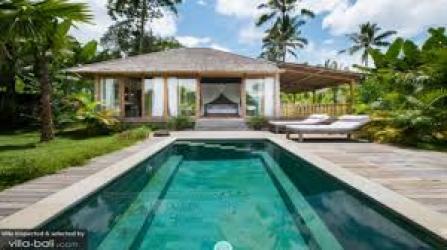 In Bali, you will have the option to cleanse on liquid only, or eat clean organic cleansing foods, or a combination of both. I will help you design the best program for your unique needs and goals before we meet in Bali and embark on this amazing journey together!